Ward off threats of Neanderthals and dinosaurs in this epic expedition. 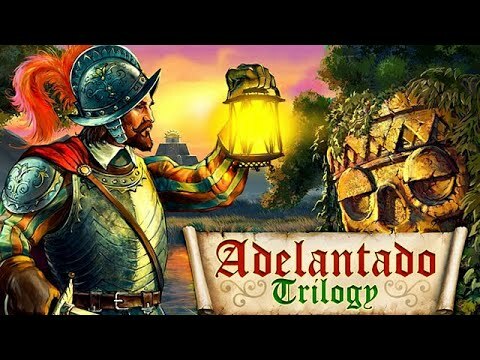 "Rather than simply following an obvious game creator path, Adelantado gives you scope to create strategies that suit your own style of play. An intelligent game, well illustrated, well thought out and a great application of time. Big thumbs up here." The quest of Adelantado concludes with an epic expedition in the third book. Repair idols, search out hidden gems and secret manuscript pages, and build bridges, woodcutter huts, fishing posts, and mines. Create industry with sawmills, smokeries, and mints. Travel through secret tunnels and operate magic levers in the right combination to activate more treasures. Ward off threats of Neanderthals and dinosaurs while maintaining the food supply and the capacity to cooperate with the natives.